In poker, it’s important to be properly bankrolled for the games you play. A failure to play within your roll will put you at risk of going broke, which is bad not only because it means you’ve lost a lot of money, but also because it means you won’t be able to continue playing. Your bankroll is all the money you have available that you’re willing to spend on playing poker. If you have balances at five different sites, then it is the sum of all those different account balances that is your bankroll. Similarly, if you have $100 on one of the sites but you’re willing to deposit another $400 without any problem, then your bankroll is $500. Your bankroll is essentially your capital for the business of playing poker. Just like in any other business, you don’t want to put too much of your capital at risk needlessly. By following the tips outlined in this article, you’ll be able to safely increase your bankroll without worrying about going broke. The point of bankroll management is to allow your skill edge to be able to work over time to bring you profits over the long run. But if you’re not a winning player, then all the bankroll management techniques in the world will not prevent you from losing your money. If you are not a winner, then you essentially have a budget for poker, not a bankroll. Players that lose or don’t take the game seriously should set an amount that they are willing to lose during a specific period of time without suffering financial harm. For example, $50 per week or $100 per month might be the “bankroll management” of a losing player. There’s no one-size-fits-all guide to bankroll management. Depending on the specific games you play, the skill of your typical opponents, your own skill level and your personal financial situation, your bankroll requirements will vary. The more variance there is in your favorite type of poker, the larger bankroll you need to weather the swings. If your opponents are tough, competent players, you’ll need a larger bankroll than if they are passive fish. If you rely on poker to pay your bills, you should be a bit more conservative with your bankroll than if you just play as a hobby. Limit Hold’em cash game players can get by with 300 – 500 big bets (600 – 1000 big blinds) in their bankrolls. No Limit Hold’em cash game players typically require somewhere around 25 – 50 buyins. PLO is a crazy game filled with variance, and it’s not recommended that anyone play with less than 50 – 100 buyins. Sit and go players may need between 75 – 100 buyins to guard against frequent swings. Finally, MTT players need the largest bankrolls of all – even a talented tournament player will lose money more than 80% of the time. 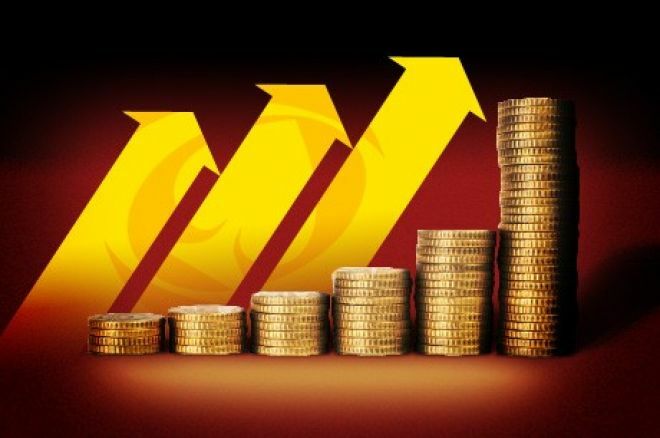 Most bankroll management guides recommend a minimum of 100 buyins for serious MTT players. Some players even suggest that 200 buyins is a better guideline. Remember, the above numbers are just suggestions. You should adjust them up or down depending on game conditions and your personal financial risk tolerance. If you’re not ready to drop down to lower stakes when necessary, then your bankroll management strategy doesn’t really exist. You should always be properly rolled for the games you’re playing even if this means you have to play lower than you would like. Whenever you play poker, it’s time to leave your ego behind. You need to make clear-headed, +EV decisions, not just while you’re playing, but also when you’re deciding what games and stakes to play. While it may feel bad to have to move down to a smaller game, if you’re truly good enough to play in the bigger game, you’ll get there again sooner rather than later. But if you bust your roll, you might not get there at all. If you’ve begun playing at a new, higher stake than you are used to playing and you run extremely hot so that you now have enough funds to be properly bankrolled for yet a higher level, you should not move up again right away. Be advised that having the proper bankroll is only one half of the equation for moving up; you also need to have the skills to win. If you’re not even sure if you’re good enough to beat the level you’re at right now, you absolutely cannot know if you can beat an even higher level. An exception to this rule might be microstakes poker. If you’ve beaten 2nl, moved up to 5nl and are lucky enough to be rolled for 10nl after only a few sessions, then go ahead and move up to 10nl even if you aren’t sure if you’re a winner at 5nl. The differences between these stakes are not very great. The general consensus among experienced players is that if you wait around the lowest micros until you know your winrate with any level of confidence, then you’ve wasted your time that you could have spent beating a higher level. This is not true at higher levels. If you’ve just moved up to 100nl from 50nl and somehow won a tournament or a piece of a bad beat jackpot and you now have the bankroll for 200nl, it’s inadvisable to move up simply because you have the money to do so. There’s a big skill difference between 50nl and 200nl, so you should only move up again when you have solid evidence that you’re a big winner at 100nl. If your bankroll decreases when you lose and it remains the same when you win, then it’s only moving in one direction – down. If you withdraw everything you win, then you’ll never be able to move up no matter how good a player you are. When you’re playing at the lowest stakes, you should withdraw almost nothing from your bankroll. The few cheeseburgers that you can buy with your 5nl winnings will not make a big difference in your life, but the delay in your development as a poker player will prove costly. If you must withdraw something, keep it minimal. At higher stakes, as you begin to make some serious money, it starts to make more sense to take profits every once in a while. You should make withdrawals at regular intervals for either a percentage of your profits or a set dollar amount. As you reach stakes that represent close to the highest stakes you can comfortably play at your skill level, then you might not need to grow your bankroll much larger than it already is, in which case you can withdraw almost all your winnings. MTT players who make a big score have a different set of considerations to deal with than other players. Due to the huge payouts possible for victory in a large-field tournament, an MTT player may find himself or herself with a way larger bankroll than that player could ever possibly use. In this case, it’s perfectly fine to withdraw the excess while still leaving a healthy bankroll on the poker site. Let’s consider again the analogy of a poker player to a normal business. We’ve already said that your bankroll is equivalent to a business’ capital. Well, what happens when a business makes a profit? If it’s a small and growing business (i.e., a microstakes poker player) then most of the profits are put back into the business to grow the capital and only a small amount is taken out for the owner’s personal use. Later on, as the company’s fortunes improve, there will be more opportunities to take profits, because the firm will not need to target as much effort on growth. At any time, it’s possible that Google will like the product your company makes and will offer to buy you out for more money than you had ever thought possible (i.e., you win the Sunday Million). In that case, it makes a lot of sense to take most of your profits and use them for other things. Winnings at the tables are just one means of increasing your bankroll. Rakeback payments, bonuses, freerolls, promotional tournament tickets, kickback deals, casino bonuses, and a whole host of other benefits can really jump-start your bankroll growth. Always investigate the offers at your poker site to make sure you’re not missing out on anything. Don’t neglect to research other poker sites’ promotions either. Occasionally, there are offers that are equivalent to 50%, 70% or sometimes even greater than 100% rakeback for a limited time. It may be worthwhile for you to move a portion of your bankroll around each month to take advantage of the best possible deals you can get. There are basically two things that you can use to make an income as a poker player: your skills and your bankroll. Don’t throw one of them away foolishly or else you’ll be prevented from using the other one altogether.